Framing memorabilia and tickets from a concert or sporting event is something that we’re seeing more and more customers wanting to do. Custom framing allows you to capture the moment so that you can relive it whenever you see the frame hanging on your wall. 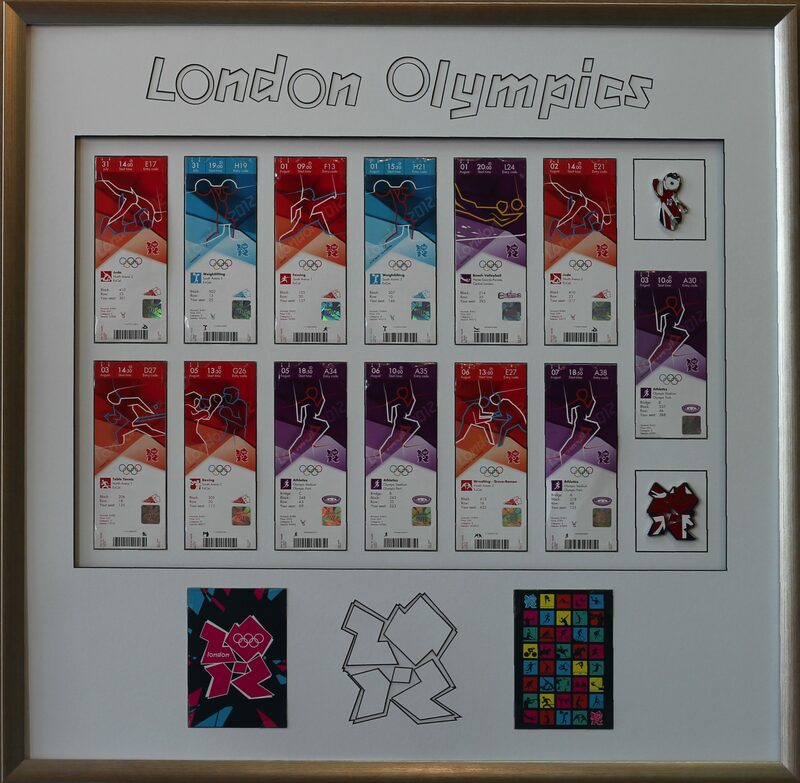 One of our regular customers recently attended the 2012 London Olympics and brought his tickets and some memorabilia in for us to frame. Four years ago we did something similar for his tickets and memorabilia from the Beijing Olympics, so we already understood what he had in mind. We just had to design something that not only presented beautifully but captured his experience. What items could I include when framing memorabilia ? Anything that reminds you of the event. We’ve framed poker chips, subway passes, concert tickets, photographs, entry passes, coins, stuffed animals etc. Think outside the square, if it means something to you, if it reminds you of the event or how you felt, then we can frame it. 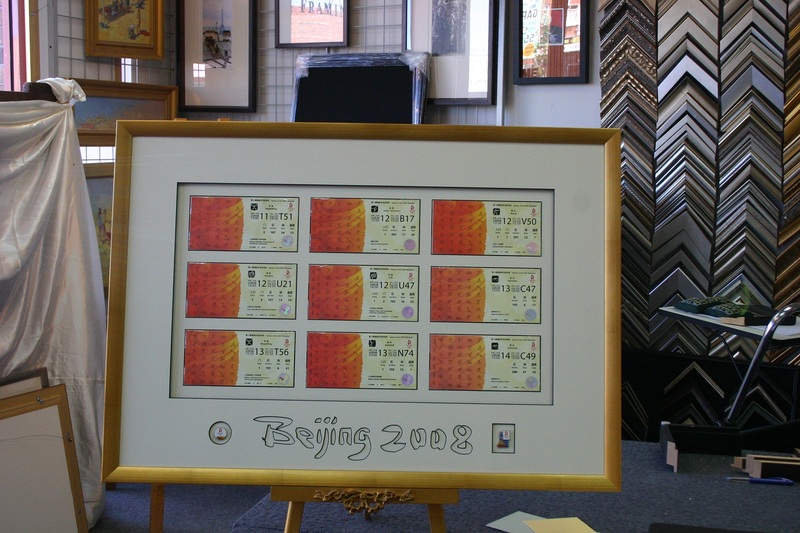 Our lucky Olympic visitor wanted to make his ticket stubs and passes a feature in his home, however the London memorabilia needed to work with the previous frame we’d designed for the Beijing memorabilia and also stand alone. When framing items that may increase in value it’s imperative that all framing techniques are reversible without damaging the item. Fastframe only uses acid free papers, mats and tapes to ensure that your item is in the same condition now and in 20 years time. To secure the ticket tubs and entry passes in place we used archival corners, they are nearly invisible and allow us to hold items in place without damaging them. We custom design each frame, this allows us to coordinate the colours of the items and their dimensions with the matts and moulding. A well framed item highlights the work. In this case we decided to used our Computerised Matt Cutter to a cut out the London Olympics Logo as a background. The logo was so unique that everyone immediately knows what it is and draws the viewer into the frame wanting to see which events our lucky customer attended. A fan of the Olympics, but couldn’t get there ?, well you can get memorabilia for the London Olympics from the London Olympics Memorabilia site.